Inquiries about automatic milk feeding are at an all-time high in the sheep sector. Farmers Guardian takes a look at some research behind the machines, and provides a round-up of the kit available. After weaning, all lambs were turned out together onto the same pasture and grazed until slaughter at 23 to 31 weeks of age. Farmers are undoubtedly attracted to automatic milk feeders because of their labour saving benefits, allowing time to focus on other important jobs, but faster growth rates are also being reported as lambs are not limited to how much, or when, they can drink. According to a trial carried out at IBERS, Aberystwyth University, there is no difference in performance of surplus lambs reared on performance-formulated lamb milk replacer, based on whey protein from cow’s milk, compared with those left on the ewe. 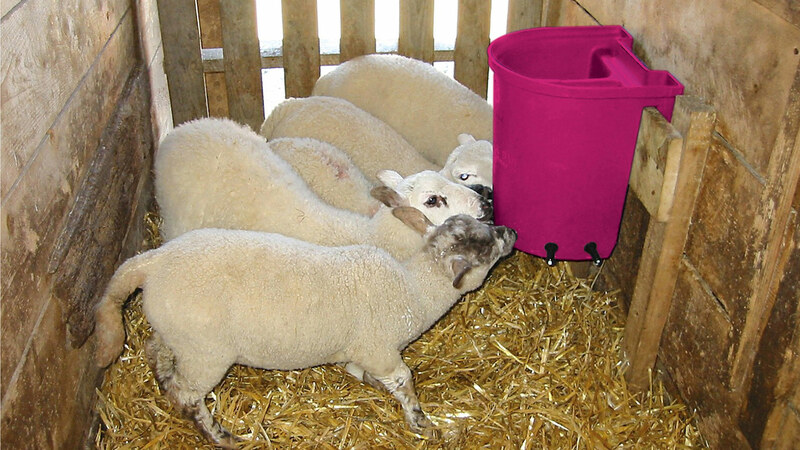 The study reports successful lamb rearing using a colostrum alternative followed by good quality lamb milk replacer. Lambs reared on milk replacer reached similar weaning weights to their naturally-reared counterparts and resulted in comparable carcase weights and grades, despite a slightly lighter body weight at slaughter. Dr Cooke says: “Lambs reared on milk replacer were reported to have some very mild diarrhoea from two to five weeks of age, but this then disappeared. Despite this, there were no differences between lambs reared on milk replacer and those reared on the ewe with the overall growth rate during the milk feeding period averaging 325g per day, and average weaning weight at 18.6 kg. The researchers also monitored lamb health status, with blood samples taken at 24 hours after birth, at weaning, and at the end of the finishing period. When deciding which lamb to remove from a triplet or quadruplet-bearing ewe, Ms Erian advises removing either the smallest or the largest one to leave a balanced pair. However, Volac stresses machine rearing, while saving substantial time and rearing hassle, is certainly no substitute for good husbandry. Dr Cooke says: “The IBERS trial highlights the importance of maximising rumen development while rearing surplus lambs on ad-libitum milk replacer. But sound hygiene is also crucial and lamb pens must be draught-free, well drained and bedded to keep lambs as warm and dry as possible.